I plan on using Google+ to fill in the holes that Twitter and Facebook leave open (I’m not on Facebook). I like being able to share geeky stuff with geeks, local stuff with locals, work things with work people, etc. There’s more room to write than Twitter, and less annoying than Facebook. It may not be truly unique, but it seems to have everything important. Interesting article! You make some very good points though I have to disagree that putting friends into ‘buckets’ is something only nerds do. I don’t consider myself a nerd (I’ve been called a techno ‘noob’ on more than one occasion), yet the ‘circle’ concept is the exact reason why I have already made the switch from facebook to Google +. Facebook assumes that I only have one persona – this is simply not true: I have my work persona, my family persona, my friend persona… and there are certain things which I would like to share with colleagues which my friends would have no interest in. Similarly, there are certain things I would like to share with all my close friends but which I feel are too ‘personal’ to share with my work colleagues or extended acquaintances. I value my ‘social privacy’ and don’t want every single person I have ever met to know every little detail about me. As a result, I am thrilled with Google + and have quickly made the transition to a more flexible way of social networking. The little that remained on my facebook account has been disabled and I doubt I will ever look back to the socially restrictive facebook days! David, points taken about the design advantages over Twitter and Facebook. But to what extend does your utility hinge on mass adoption by others? Luci, just to clarify: what I believe Yishan is saying (and which I agree with) is not that people don’t have natural groupings of friends, but rather that people don’t like putting effort in an online system to maintain such a representation explicitly. That’s why I think Google needs to learn from a few examples and streamline the process. It’s not like Google hasn’t though about this already. In any case, I’m curious to see more responses. I am keeping an open mind, despite my skepticism. I am not a much fan of facebook. I like the twitter and linkedIn to get regular updates on professional subject. I want to try Google+ now if it has network of professionals i.e circles to get the latest updates. How Google+ evolve is going to be interesting. Read lots of posts suggesting lots of possibilities outside the box. In education, businesses, groups and organizations. Once Google integrates apps, search, full mobile and deploys it through Chrome, Android and iOS its really hard to imagine where it might go. • A couple of months ago, I forced myself to open a Facebook account and force myself to use it at least a few times per week, primarily because in the future, I want to have some data to mine and fuse Facebook data with data from other social networks in order to have real-world development data for an Android tablet app that will support interactive, exploratory graph browsing and editing which I hope to create (in my spare time) later (TBD) this year, after I get the time to read the book: Mining the Social Web (http://oreilly.com/catalog/0636920010203). • For me, Facebook does a very poor job of suggesting new friends or new “things” (like books) in my interest areas. • I really like the fact that Google gets that each person has multiple areas of interest and allows users to create circles and associate friends with one or more circles. For instance, whenever I post something, I usually do so knowing that at most, only perhaps 10% of my friends will be interested in my posting (or even understand it). • My interests are diverse and include: 1) vintage tube guitar amplifiers and modern re-creations thereof, 2) stereo scenic photography and photography equipment, 3) graphs and applications incorporating graphs, 4) music: renaissance, baroque, classical, and 20th century periods, jazz, and various sub-categories of rock, 5) national (NIH) progress in the areas of health, education, and environmental factors research, 6) technology trends, 7) activities and status changes of friends, 8) good books (in many topic areas! ), 9) prior shared acquaintances and experiences, etc. • So, given the above, the Circles feature alone has me looking forward to getting to use Google+ in the future. • However, I think perhaps Circles may be conceptually off the mark. Most of my friends share only a very small subset of my interests (topics). So, they don’t neatly fit into a single, specific topic or topic group. (For simplicity) I think it would be better to mimic the model of pub/sub messaging systems and create Topics to which your friends (or perhaps non-friends) can subscribe or be assigned. (Of course, the topics should be unique nodes in what could be loosely described as a user-extensible topic tree.) Users should be able to extend out-of-the-box topic trees, and the social network provider should find a way to infer (same-as) topic nodes of one user with equivalent nodes in another user’s network’s topic tree. • For me at least, very few of my friends are online, or in the mood to video chat, at the same time. I sense that asynchronous posting to threads is probably preferred by many people vs. synchronous video discussions. Plus, there are scaling issues with video chat (screen real estate, one-speaker-at-at-time, etc.). • Speaking of scaling, I would like to see someone develop a way to “scale” thread/topic collaboration/discussion into participant counts exceeding 10,000. For user counts this high (not only concurrent, but spread out temporally over months), video chat (Hangouts) is just not very practical. What is really needed is clustering of user sentiments and a clear way to visualize (and perhaps support distributed voting on) the unique, distilled points of view that have been expressed. • When I post that I “like” something, this is frequently based upon only one or two attributes of the “thing” – not the entire thing. For example, I might really like the woodwind parts in 8 specific bars from a Brahms symphony recording, but may not like the interpretation of the symphony by the conductor, or the quality of the recording. Another example: I might really like EVH’s guitar solo in a Van Halen song, but do not like the vocalist, the vocals, the lyrics, or the subject of the song (and would want to clearly disassociate myself, publicly, from some of these other negative attributes). • Also, I might want to make statements such as I like a specific genre, author, composer, etc. without having to list individual works. Facebook’s user profile information is so structured and granular that this information is of little value. I don’t think any of my Facebook friends have even looked at my profile’s contents. I, for one, am always on the lookout for new book suggestions. • But here we hit a wall – to permit users to make the types of statements I want to make, the social network provider should not really presume they can enumerate, ahead of time, (aka “hard-code” the UI) all the topics and posting attributes that anyone would care to use. They should be able to make a good start on this, but need to leave this aspect of their system editable and extensible by end users. • The challenge here, of course, is that traditional web UIs do not lend themselves to complex or extensible statement entry. The trick is to invent new UI approaches that average users can intuitively grasp, yet which offer the expressivity I seek. I don’t know if Google can pull this one off, or if they even want to try. • And of course, I expect a useful social network to do a good job of suggesting new friends and “things” I would probably like (including other underway discussions). To do this, the actual data should stored in graphs, not unstructured text. This comment is already too long, so I’ll stop here…. The above are my comments on Google+ and part of my wish list for social networking platforms. These are interesting problems which I feel can be solved. And I think you make a good point about topics / interests vs. social partitioning as a way of organizing discussion. I’m curious what you think of Quora’s tag-oriented approach as compared to Google+’s metaphor of social circles. Or perhaps this is what Sparks is supposed to become? Just one question, Dan. What are your thoughts about a company that wants to build a social network but prevents interested users from joining — even after they’ve been invited? Seems like an extraordinarily counterproductive approach. Heh. I can’t believe this is quite how Google planned it. I don’t know if that’s because Google didn’t anticipate the interest level (hard to imagine that’s the case) or because Google is running into unanticipated scaling issues (which seems more plausible). Or for some other reason entirely. But I think Google is lucking out in that there is enough of a flow of invites to keep Google+ interesting for folks on it while enough pent-up demand to sustain press interest. @Daniel, regarding Quora, I really haven’t used it before, so I just signed up to get an initial impression. While it is interesting, I cannot tell from the UI if it is backed by an extensible topic tree, which in turn is used to populate the linear drop-down lists. In any event, the few explorations I made were a bit disappointing. Also, I wasn’t impressed that a question phrase was actually part of the URI. I would have preferred to see questions as being (probabilistically) associated with one or more (precise) Topics, and then presenting a user with the list of question Titles for the Topic(s) selected from a list or Tree. Still, I think that a linear drop-down list approach might be a workable (starting point) UI approach with a bona fide topic tree back end. I hate to use the words taxonomy or ontology (as these are very expensive to create, maintain, and get right) but I think something like this (what I referred to as a topic tree) is required in order to accurately catalog and mine information. I also think that (unsophisticated) average users could, in fact, effectively use such a tree-backed system. Again, I think some innovation in the web UX area would be in order. And, regarding Circles, it occurred to me that Circles might be beneficial for categorizing/grouping members in one’s network, solely for this purpose while keeping the mappings of which users subscribe to which topic feeds completely independent from Circles, with the possible exception of authorizations/filtering (not allowing certain members of certain Circles to subscribe to specific Topics). In fact, I can visualize a UI a user might use to create/define a new Circle where the user might want to define it by checking one or more check boxes from a list similar to the above (truncated) sampling of initial ideas. (A hierarchical checkbox tree would be better.) That is, OR together one or more of the social attributes that “define” a particular Circle. Finally, let me state that I think the social networking market is wide open – I don’t think anyone does it well, and would be surprised if Google gets it right. LinkedIn is doing a pretty good job for professional social networking, but still has room for improvement in several areas (ping me for suggestions). For me, the key to displacing Facebook is simple. Better security and data portability. If Google+ can deliver on just one of those, I’ll leave Facebook. At the same time, I’d stay with Facebook if either one was definitively resolved. The race is on. Richard, I’m curious how much work you’d put into maintaining the 11 circles you describe. Would you follow each of their streams independently? Carefully choose which of those streams (or which of the 2^11 subsets of those streams) to post to? And where do topics fit in? Do you want to tag people with topics (e.g., a circle of folks based on their interests) or tag content with topics? Brian, I am sure Google will deliver on data portability, given what Google has posted officially about Google Takeout. I think it’s too early to judge how Google will deliver on security relative to Facebook. Thank you for your follow-up posting. It’s really not as bad as you’re suggesting (the 2^11 comment, for example). I wish I had seen your posting earlier, as I would have had time to respond to it tonight. Let me respond to your questions tomorrow evening. I think you’ll find that my quickie brainstorm ideas from earlier today play out pretty well. PS: Is it possible to insert PNG images in these postings? Interestingly, my wife has hated facebook for a long time. and i read (in the news) that the mass exodus from facebook was already beginning (that was before G+). my wife strongly dislikes the tension between real friends and old friends or semi friends, and i think a lot of her network do too. my wifes on G+ now, but definately struggling to make headway with most of her friends unable to join up, or move over. im concerned, though (since i read it), that facebook will update its functionality quickly and then that major draw for people like my wife will be removed. my main desire is still integration! some form of integration with twitter, fb, and foursquare in particular, then people can begin transitioning. Also, in my previous posting, I did not take the time to list some plausible Topics. This evening as an exercise, I studied my entire Facebook posting history and my friends list. After this, I then created a set of actual candidate Circles and Topics, and finally, associated one or more Circles with each Facebook friend. It turns out that the Topics seem to be primarily determined by the user’s likely set of posting Topics, and were only loosely related to their friends. I suppose a user could expose their quasi-private Topic list to their friends and allow them to request subscription to them. So, take a look at this low-fidelity, half-baked UI mockup and let me know what you think. After going through this exercise, I don’t think I’ve quite reached the point of changing your mind WRT the objection you raised: that most people won’t want to go to the trouble of configuring and maintaining Circle information. But, I think that given more time to refine and ponder use cases and other UI changes, it may be possible to make it user-friendly enough to be adopted by the average user. As @Luci pointed out, there are many reasons to have multiple posting “channels” to control posting distribution. Nicely put. 🙂 I love the expressivity, but I just don’t see mass adoption. Nor has Facebook. Microsoft has spent billions of dollars trying to catch up with Google in search and is currently losing >$1bn per year to stay in the game. Prediction: Google will spend billions of dollars trying to catch up with Facebook in social networking and is currently losing (big time). Some 700m+ people have already voted and decided that Facebook is for them. There will be lots of people who will want this, that and the other Facebook improvement but there is no tangible evidence that Facebook users are fleeing in droves to Google+ or are planning to as people did from MySpace to Facebook. While Microsoft were focused on Google they de-focused on mobile and Apple 2.0 happened. While Google focuses on Facebook, the next new thing will happen without them. Richard, thanks for the detailed comment! I think Jeremy has met his match. Yeah yeah yeah. Veeeerry funny. But seriously, I was trying to come up with some usual contrarian viewpoints, and I had a hard time with it. Mostly because I haven’t joined Google+ yet, and don’t really have much to say on the particulars of the network itself. However, I do have a question/meta-comment about the network as a whole. Given Google’s oft-repeated public statements about the virtues of “openness”, how open is Google+? I mean, not only how easy is it (or will it be) for anyone to write an app for the network. Or to import and export your contacts. But how easy is it to extend the network itself, the same way I can extend the internet network by adding my own server? Will I be able to add another Google+ server? Can I take part of it private? Can I host some of my circles locally, as in on my own machine? To me, the biggest problem of social networks is that they’re centralized. I want something decentralized, peer to peer. Something as open as the internet itself. 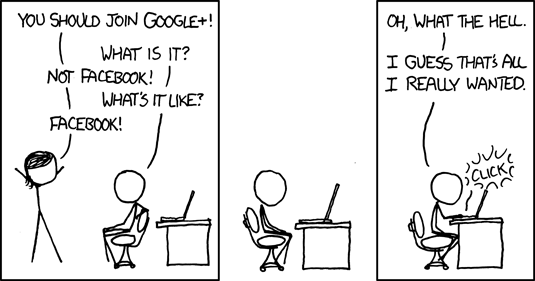 Will that ever happen with Google+? If not, then they’re just building another centralized (aka closed) network. Dinesh, there’s certainly something to the analogy of Google+ to Facebook being like Bing to Google. It remains to be seen whether Bing will be a successful long-term investment for Microsoft. Same for Google+. But like you I prefer when companies more tightly focus on fewer things to do amazingly well. Jeremy, I note that the person who wrote “The Meaning of Open” is no longer at Google. I expect Google will push openness at least relative to Facebook, but I wouldn’t expect anything as extensible as you describe. Especially not after the failure of Wave and the non-success of Diaspora. Darn, Facebook and Twitter don’t want to play ball with Google. Gee, what a surprise! Even if the person who wrote “The Meaning of Open” is no longer at Google, doesn’t Google itself still espouse those positions? The blog post does consistently say “we” throughout. And references Vint Cerf, who I think still works at Google, and who Google greatly admires. I think Google would see Google Takeout as embodying its openness promise. Now as in the past, Google’s openness isn’t absolute. Not asking for absoluteness. Asking for there simply to be parity with the openness that is the Internet. Didn’t Google itself say at one point that FB should be open, like the Internet is open? I try to use FB to promote my consulting business and website but it’s practically useless. And so much stuff on it doesn’t even work. Lists are worthless. I can’t get the thing to send messages. I sent some messages last August that some people only got this past May. I’m ready to give + a sh0t. I think all of these tools are designed for inbound rather than outbound marketing.